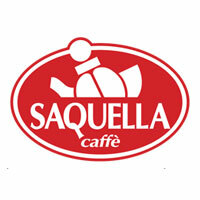 For coffee, Saquella is the first choice for many sophisticated bars and restaurants. An espresso with a full, round aroma and a soft, dense crema. In 1852 Clemente Saquella began trading spices, tea, and cocoa. It was not until 1930 that the two Saquella brothers specialized in roasting green coffee. The first factory was opened in 1945 and equipped with a Vittora 25 kg, which was quickly replaced by a Farina 120 kg. Today, Saquella Caffè is a large coffee roasting plant that has been run by the Saquella family since 1852. The quality was always at the center the company philosophy, consolidated in 150 years of experience, and today this is still our principal objective. Quality is reached and obtained at every level of the production process: from the careful selection of the coffee origin, the blending, the final roasting even to the innovative system of packaging. The blends are composed of about 10 different varieties of coffee originally pure Arabica and also Arabica and Robusta to satisfy the different consumer tastes. In Italy, Saquella Espresso is served in countless bars and restaurants. You can expect a very good body and a thick crema.